Carrie Parker laser-cuts her acrylic pendants in the shapes of their color pigments' molecular compounds. We know the sunny look of yellow, blue's sky-like hue, and leafy green. But they look different at the molecular level, as Carrie Parker's necklaces show us. 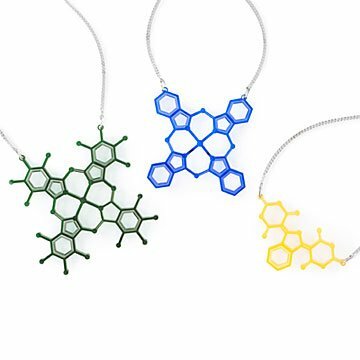 Inspired by her parents—a chemist and a science teacher—Carrie geeks out on the molecular geometry of three pigment colors with her acrylic necklaces. She laser-cuts each one in the shape of the essential compound that makes it appear to our eyes as yellow, blue, or green. Based on the symmetric complex organic pigments Yellow 139, Phthalo Blue, and Phthalo Green, they make distinctive gifts for artists, science teachers, stylish nerds, and molecule-loving moms. Both hang from 18" sterling silver chains. Handmade in Pittsburgh, Pennsylvania. The daughter of a chemist and a science teacher, Carrie Parker grew up surrounded by language and learning. Her first job was teaching English in Japan. While later working as a high school teacher in Pittsburgh, she started her jewelry business as a creative outlet. Now, she and her husband Joe make jewelry that helps science enthusiasts show off their geeky obsessions. Green: 2.25" L x 2.25" W; Blue: 1.63" L x 1.63" W; Yellow: 2" L x 1" W; Chain: 18"
Jewelry pendants are made of plastic and should be handled with care and kept in a dry location.